Miscegenated Family Album (Sisters IV), L: Devonia’s sister, Lorraine; R: Nefertiti’s sister, Mutnedjmet, 1980/1994. Alexander Gray Associates is pleased to announce Lorraine O'Grady: Family Gained at the Museum of Fine Arts, Boston. The exhibition celebrates the recent acquisition of Miscegenated Family Album (1980/1994). When the Boston-born, New York-based artist Lorraine O’Grady (born 1934) visited Egypt in her 20s, two years after the unexpected death of her sister, she found herself surrounded for the first time by people who looked like her. While walking the streets of Cairo, the loss of her only sibling, Devonia, became confounded with the image of “a larger family gained.” Upon returning to the US, O’Grady began painstaking research on ancient Egypt, particularly the Amarna period of Nefertiti and Akhenaton, finding narrative and visual resemblances between their family and her own. 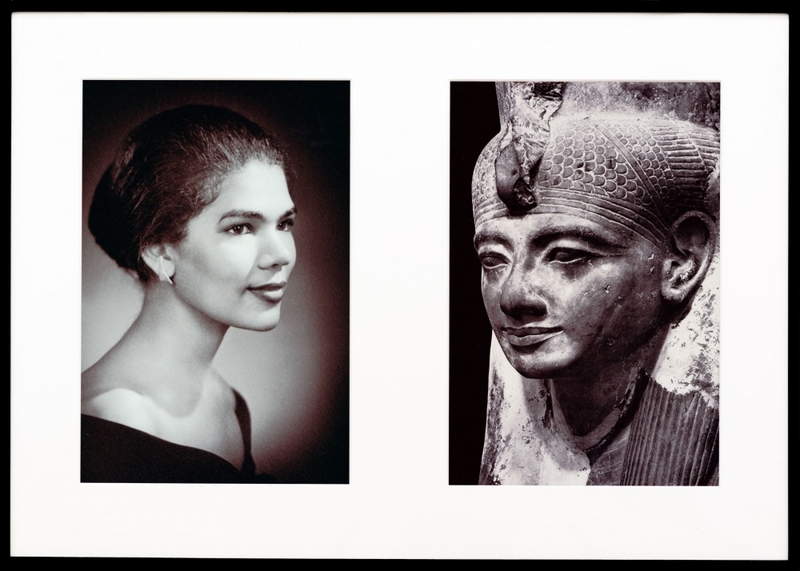 The exhibition celebrates the recent acquisition of Miscegenated Family Album (1980/1994)—the first work by O’Grady to enter the MFA’s collection—consisting of 16 diptychs of color photographs that compare Devonia’s family with that of Nefertiti. The title of this major installation reclaims the pejorative term “miscegenation,” which was used in the context of the post–Civil War laws that made interracial marriage illegal until 1967. In this strongly feminist “novel in space,” as the artist describes it, O’Grady attempts to resolve a troubled relationship with her older sister by inserting their story into that of Nefertiti and her younger sister, Mutnedjmet. Paired images form visual “chapters” on topics such as motherhood, ceremonial occasions, husbands, and aging. Also on view, for the first time, are the only remaining photographs that document Nefertiti/Devonia Evangeline, the 1980 performance that led to Miscegenated Family Album. “Lorraine O’Grady: Family Gained” represents an important moment of exhibiting the photographs in the city where O’Grady grew up in a family of Jamaican immigrants. Installed at the MFA, which contains one of the world’s greatest collections of ancient Egyptian art, the work reflects O’Grady’s view of ancient Egypt as a “bridge” country—the cultural and racial amalgamation of Africa and the Middle East, which flourished only after its southern half conquered and united with its northern half in 3000 BC. Both families featured in the photographs—one ancient and royal, the other modern and descended from slaves—are products of historic forces of displacement and hybridization.